Son of Arthur W. Kemp of Harrow on the Hill. A donation to the memorial statue has been made in honour of this soldier. Kemp entered Chichester House in 1911. He was not very long in the School, and left in 1912. 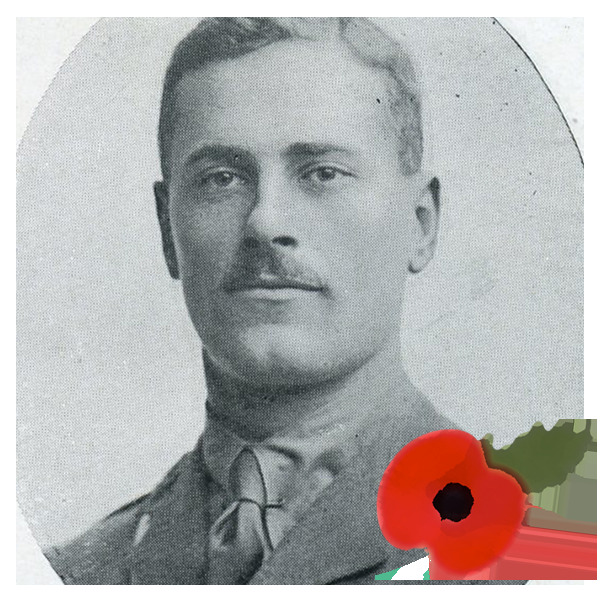 He enlisted in the Middlesex Regiment, and served in France with his Battalion as a Private. He was afterwards recommended for a Commission. After passing through a Cadet Battalion, he was gazetted 2nd Lieutenant in his own Regiment. He had the opportunity of remaining in England due to a slight physical defect, but asked and obtained permission to go abroad, and left England on November 30th, 1916. The following extract is quoted from a senior officer's letter: "Your son was in command of a party of a company, who were supporting a small attack, and after the objective had been taken, while directing his men at work in the trench, he was shot by a sniper straight through the heart. We all of us mourn one of the best officers and nicest fellows we had had in the Company: every single man is loud in his praise of the way he behaved on the morning he was killed. All through a very trying time he kept absolutely calm, and remained encouraging and calming his men, both by word and example." William Meadows Kemp born on 8 June 1896 as the only child of Arthur William Kemp, a London parfumier, and his wife Alice. At the time of William Kemps’ birth he appears to have lived in Wandsworth, London but it appears that the family later moved out to Surrey. William Kemp was a pupil at the school for only a brief period of a year between 1911 and 1912 and was a member of Chichester House. No records of his time at the school, or indeed why he was sent to Brighton, remain. Shortly after the war began William Kemp was commissioned into the Middlesex Regiment as a 2nd Lieutenant. Originally a small regiment the very populous recruitment rea of the Middlesex regiment, essentially the entire Western suburbs of London ensure that it became one of the largest regiments in the British army over the course of the war, raising a total of 49 battalions. This meant that officers were frequently, as in William Kemp’s case, posted to different battalions at different times. It appears that William Kemp served the majority of his time in command of platoons in the 3rd and 16th battalions but his service record indicates a number of changes which must have been unsettling for both the officer concerned and the men under his command. On the 28th February 1917 William Kemp was killed in action in France near Saily-Sallisel in the Somme area. He was one of the astonishing 12,270 officers and men from the Middlesex Regiment killed during the war but was, it appears, the only member of the Middlesex from that regiment killed in that area on that particular day. Unlike the previous year the Somme in February 1917 was actually one of the quieter areas of the front and William Kemp was, sadly, very unlucky to have been killed, perhaps by a stray artillery shell, that day. He is buried in a marked grave in the Sailly-Saillisel British Cemetery.